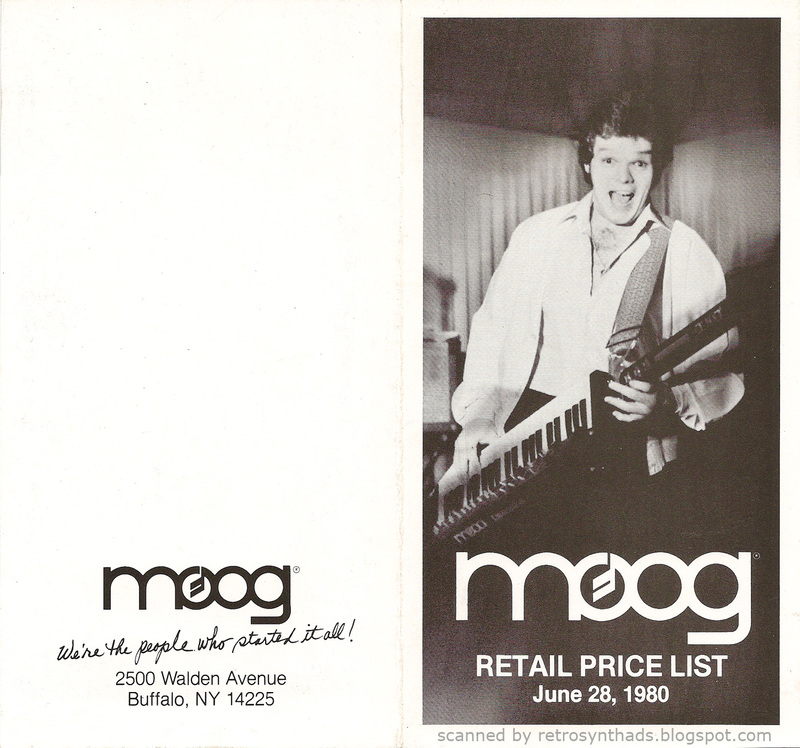 Moog 2-page fold out Retail Price List from June 28, 1980. What isn't to love about this price sheet? 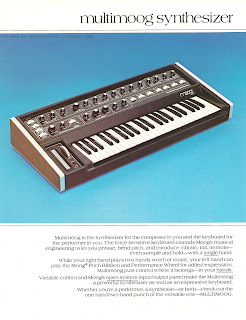 A list of awesome Moog synths? Check! 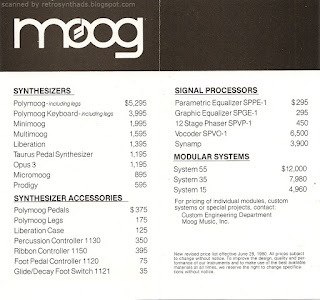 Retail prices for those synth history buffs like me? Yup! And last but definitely not least, Tom Schuman from Spyro Gyra. 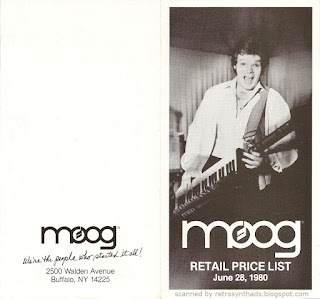 No wonder he is smiling, by the time this price list came out, the guy was still barely into his twenties and already had three albums under his belt. AND he's playing a Moog Liberation keytar. That would definitely make me smile too. If this photo of Tom appears familiar, it probably means you are old. Or a fan of vintage synth ads. 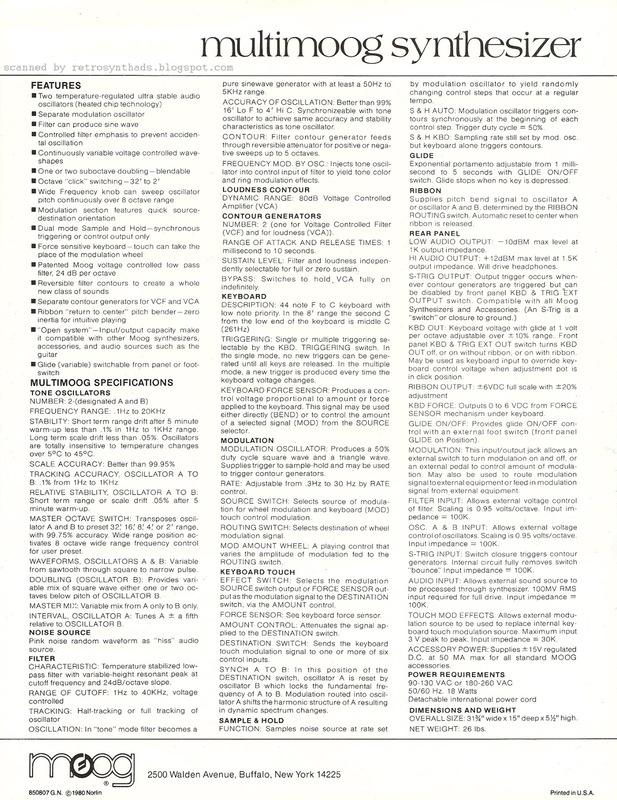 Because a full colour version appeared in a July 1980 Moog Liberation advertisement, around the same time this price list did. 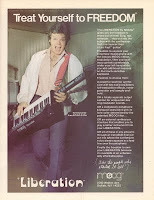 As mentioned in the blog post for that ad, 1980 really was the year that the Keytar broke out. Which makes it a good year indeed. 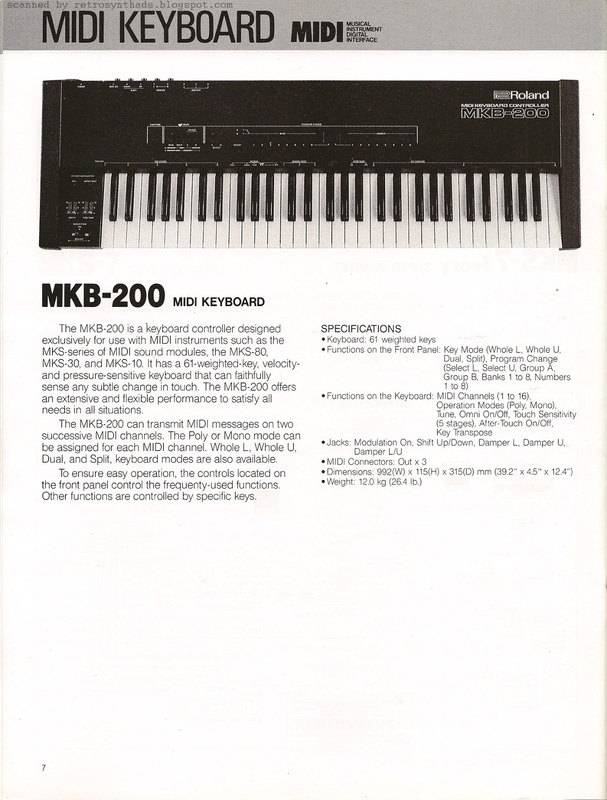 As mentioned above, as a synth history buff, I love to see prices listed. Most ads don't include prices and its like a puzzle missing one of the most important pieces. 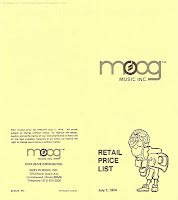 I've posted a few other Moog price lists (with more to come!) and its fun (and a little terrifying) to watch inflation unfold. 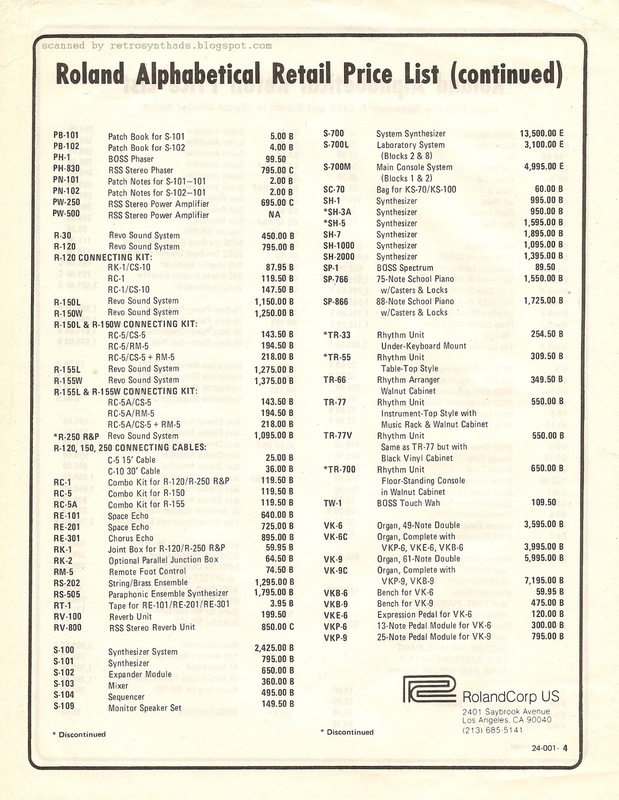 For example, The July 1, 1974 Moog Retail Price List contains some of the same products, and I've included a few of those below for comparison. 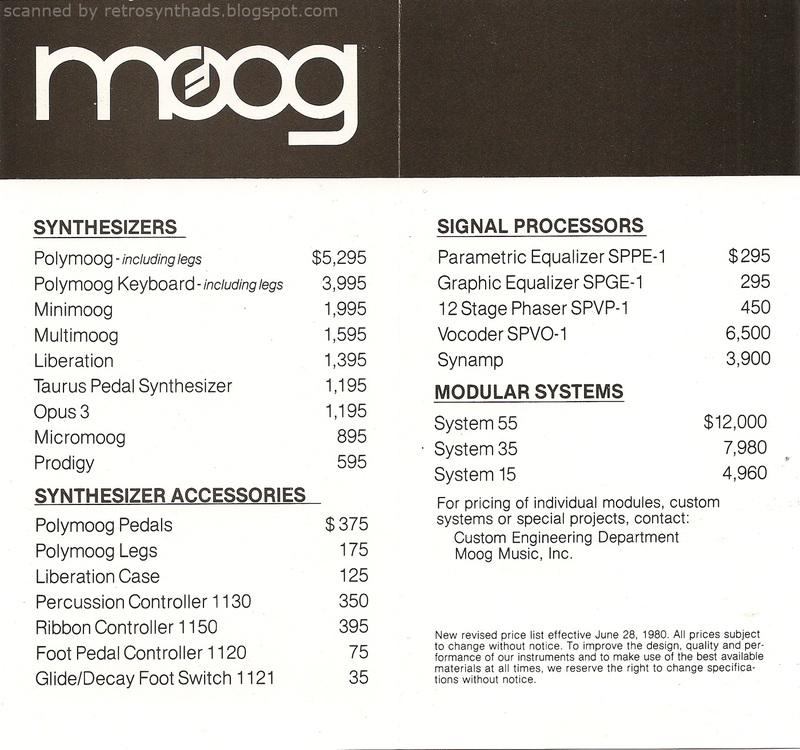 Also, the March 1, 1976 Moog Professional Systems Price List gives us a good comparison for their modular systems. Time to look for more Keytar ads. 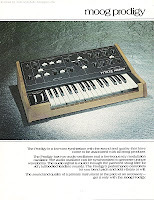 Sequential Circuits "Choice of the month" centrefold colour advertisement featuring the Prophet-10, Prophet-5 and Pro-One from page 42 and 43 in the May 1982 issue of International Musician and Recording World. I was doing a bit of research in back issues of some magazines for a lawyer last night and while casually flipping through one of those mags, this suddenly appeared before my eyes. I've never seen it before. Ever. Time for a quick blog post! 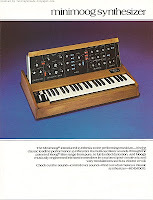 In my defense, it's not in the advertising index of this magazine - a technique I use to quickly reference and log some synth ads. Another SCI full page colour ad that appears on page 36 *is* in that index. But not this one. There also doesn't seem to be a reference elsewhere in the magazine as to why SCI became the "Choice of the month" for the magazine. There was a "Special Focus: Keyboards" article this month. So, I'm guessing it was supposed to be related to that. It actually looks more like a poster image that's been re-used for this "Choice of the Month" image. There is no ad-title or text. And the image itself doesn't stretch to the far right and far left of the pages - there is white space at both ends. I've left the white in the scan to make the point. But its a poster or image I've never run across. I haven't seen it in other magazines and I haven't seen it hanging on the wall in the background of any of the Dave Smith demo videos. 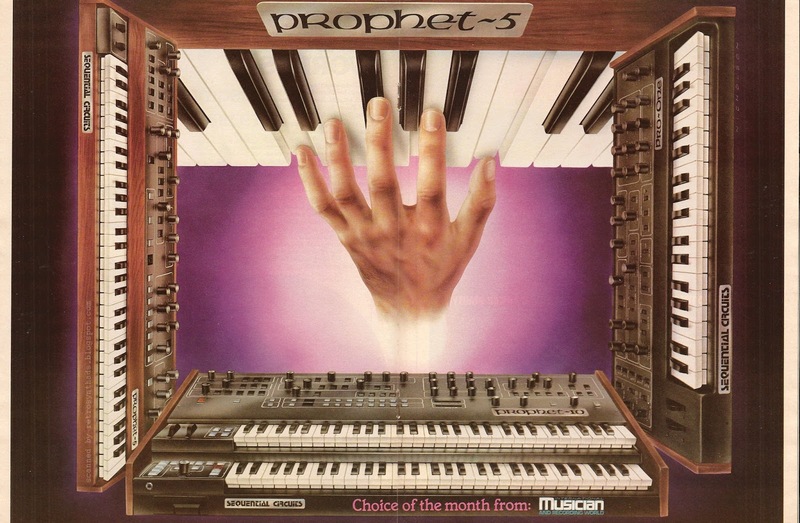 The main image of a hand playing a Prophet-5 keyboard is very reminiscent of SCI's Poly-Sequencer advertisement that appeared a few times in Keyboard Magazine from 1981 to 1983 (a long shelf life for any ad!). 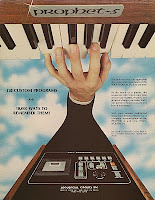 The hand in this ad and the one in the centrefold illustration are even playing the same chord. 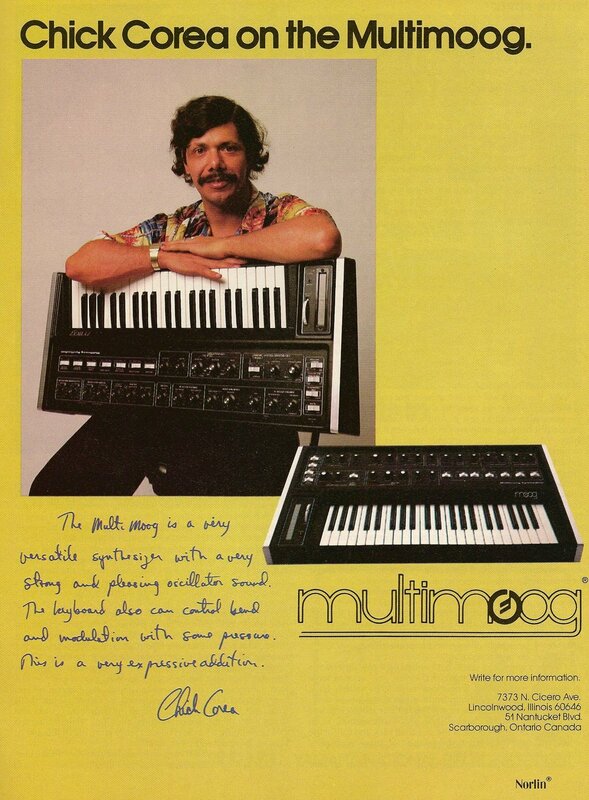 It was definitely an inspiration for Nicholson, the artist who's name appears vertically near the top right of the image (just underneath the also-vertical Prophet-5). 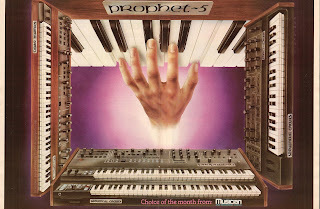 The rest of this wonderful illustration consists of a Prophet-10, Prophet-5 and Pro-One used to frame the main image. While comparing the Poly-Sequencer ad and the centrefold, I noticed something. Did you notice it too? 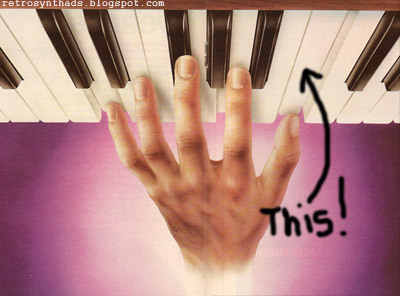 The fingers are playing the exact same notes, but in the illustration, there is a lot more space between the thumb and index finger. It took me a few seconds for my brain to figure it out. In order to even out the fingers in the illustration, Nicholson took a bit of liberty (and warped reality) by adding AN EXTRA KEY into the octave. That takes balls. And makes this illustration even more unique to me. But it may be why the image hasn't been seen elsewhere. 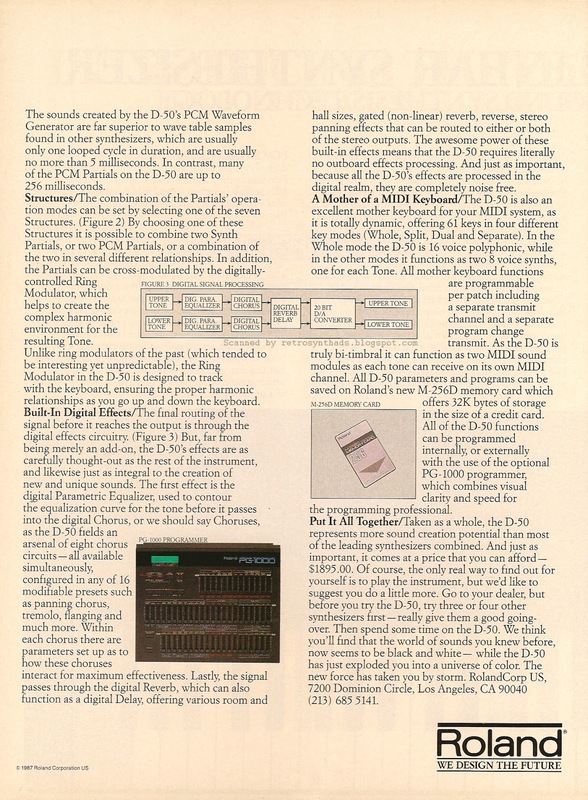 Roland D-50 "A new technology is creating a powerful storm in the world of sound synthesis" four page colour introductory advertisement from pages 89 to 92 in the June 1987 issue of Keyboard Magazine. I had a lovely 909-related post ready to rock and then... BOOM! Roland announces their new D-05 Boutique module based off their 1980's best selling D-50 synthesizer. Luckily I had been saving this draft of the D-50 four-page introductory advertisement for a special occasion. And I can't think of a better one right now. (And bonus! 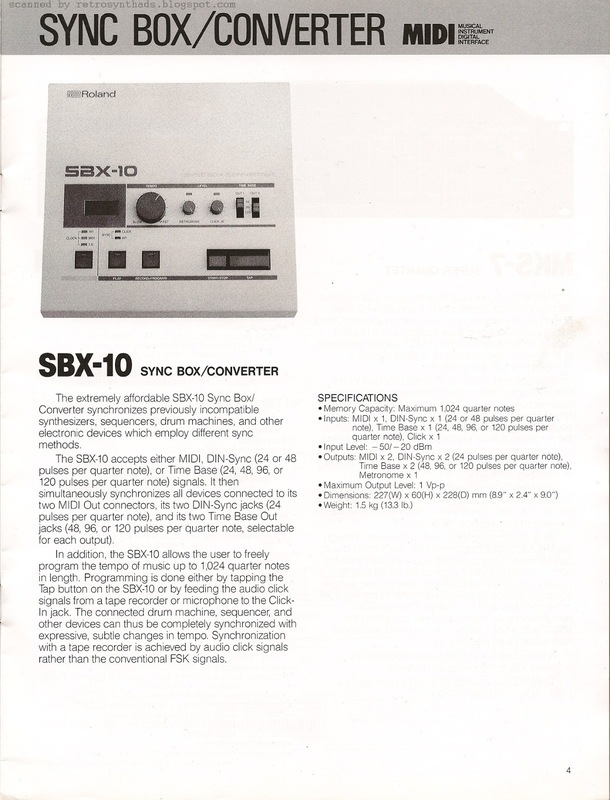 I have a 909-related post ready to go for the next 9/09 day!). 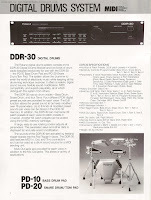 Roland introduced Keyboard readers to the their new D-50 synthesizer in the June 1987 issue with this four-page ad. 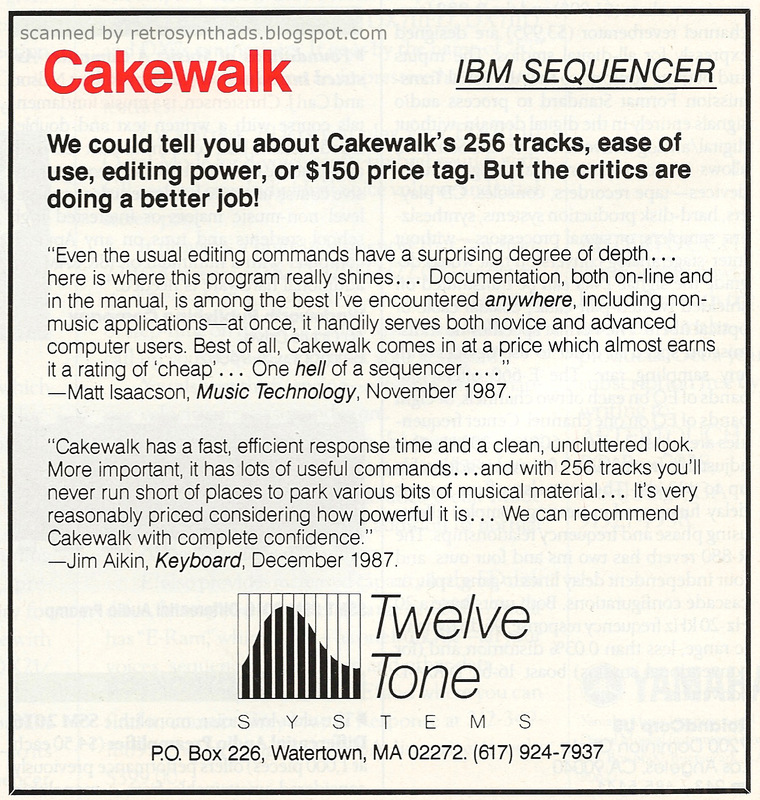 Its not often you get to see a four-page advertisement in Keyboard magazine. And its definitely not often you see it run for four months in row. That's a lot of advertising dollars. 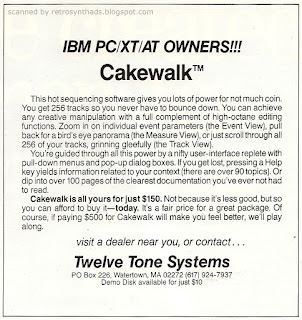 And then Roland just pared it down to a two-page ad and continued to run it. 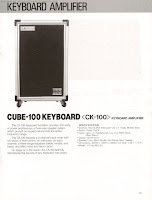 Although Roland began advertising it in June 1987, its possible the first time that readers of Keyboard were introduced to its existence was two months earlier in Ted Greenwald's winter NAMM article that appeared in the April issue. The D-50 received top billing! 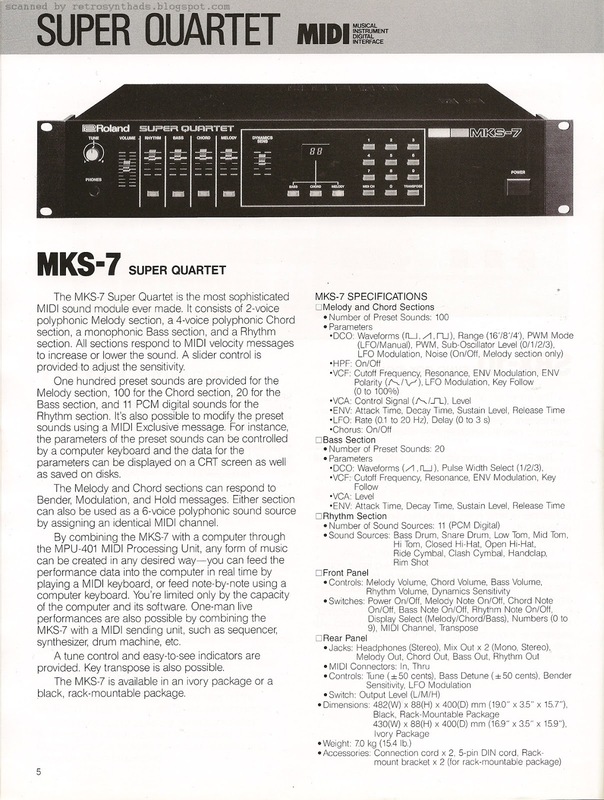 "For a couple of years it took small American companies such as Sequential and Ensoniq to prove to synthesizer players that there is, indeed, life after the DX-7. So it was a surprise to see the big boys grab the spotlight this time around with some exciting new instruments." "The indefatigable Roland led the way with the D-50 Digital Synthesizer, the obvious highlight of their prolific new offerings, and possibly of the entire show". 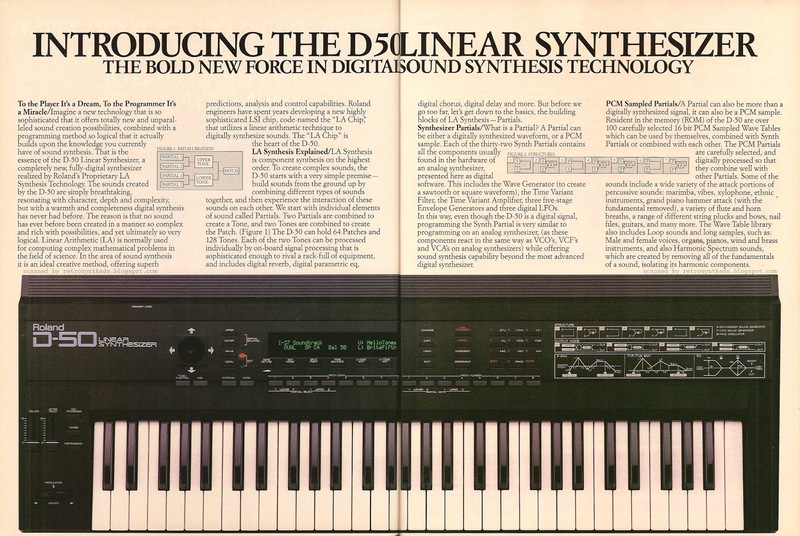 The D-50 really did take the synth world by storm in 1987. 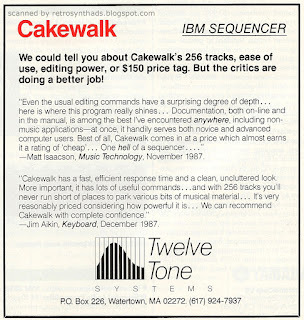 Ted Greenwald drew the lucky straw and also got to write the Keyboard Report that appeared in the September 1987 issue. 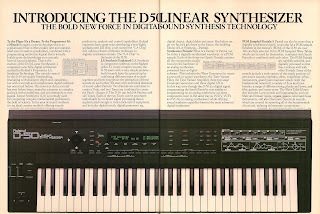 "While Sequential and Oberhaim addressed the problem by designing polytimbral instruments (the Six-trak and the Xpander), and Roland and Yamaha started packaging two synthesizers in one case (DX-5 and the JX-10), New England Digital gave the Synclavier the ability to layer four sounds, either synthesized or sampled, under one key." 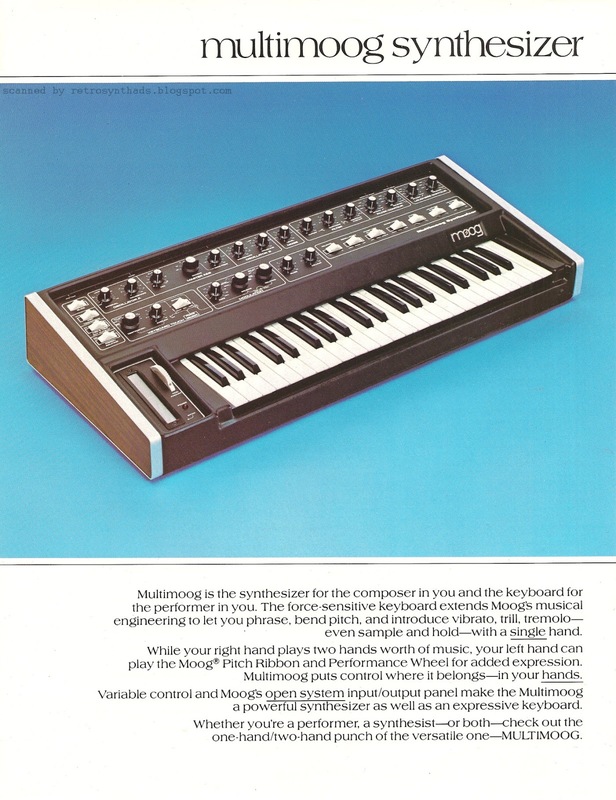 What he was saying is that Roland's D-50 allowed synthesists to add a little sparkle of "Synclavier" into their productions at a fraction of the cost. 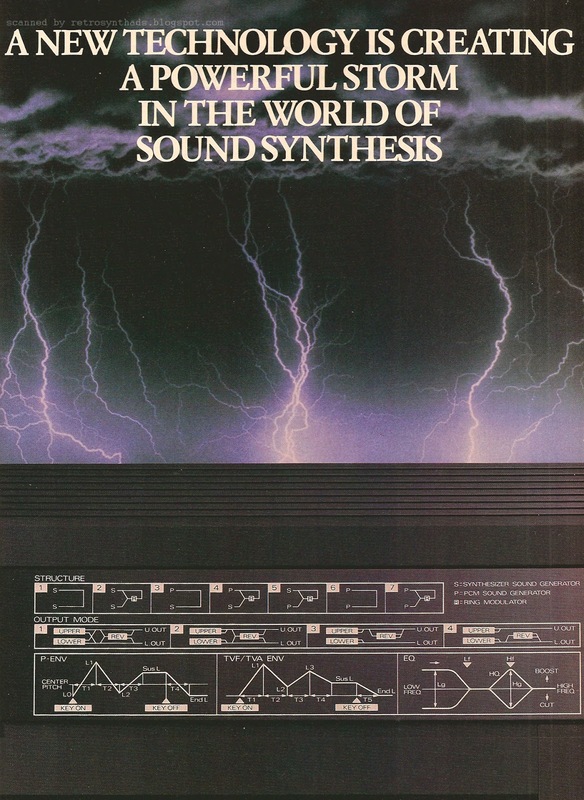 The three-and-a-half page Keyboard report gets into all the aspects of the synth including the basics of linear arithmetic synthesis, how the samples are incorporated into the synth, the effects (reverb and delay in a synth?!?! ), and the front panel interface. 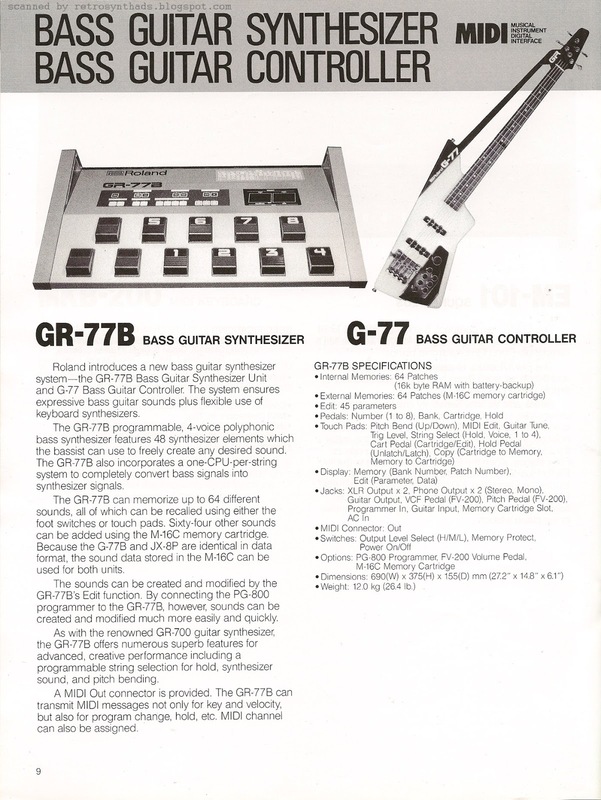 On that last topic, its noted that programming can get complicated with all the menu diving, but luckily Roland decided to keep the tradition of pairing programmers with their synthesizers and offered up the PG-1000 programmer right out of the gate. "LA synthesis is a success, and we expect that the D-50 will be as well, even if some corners were cut to get it into such a competitive price range. ... An instrument this capable for under $2,000 would be a strong contender for Keyboard Of The Year even if it didn't include reverb, delay, chorus and EQ effects. In the coming months, we're expecting some of the factory patches to become as ubiquitous as that blasted DX-7 Rhodes sound. Keep your ears open". He definitely got that right. And with the D-05 Boutique I'm expecting and looking forward to a resurgence in those patches! I was a resurgence in Enya cover bands using that Pizzagogo patch. And yes, I'm evening looking forward to hearing how the Digital Native Dance patch is going to be incorporated into synthwave. Now time to enjoy my 9/09 day! 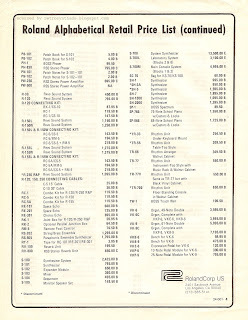 Roland Alphabetical Retail Price List for September 1978. 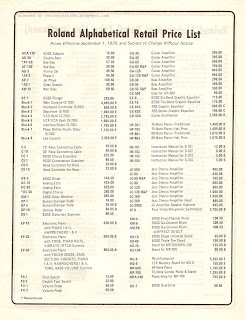 I had recently come across this price list and thought it was interesting enough to share. Don't really have much to say so I'll just start typing and see what comes out. 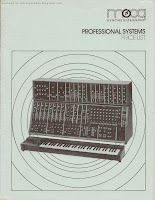 Well, gotta say it's a great list of historic gear that includes price lists for Roland's early synthesizers, drum machines,effects units and a wack of other things. Also, seeing prices for the System 700 and in particular the Laboratory system is kinda cool. 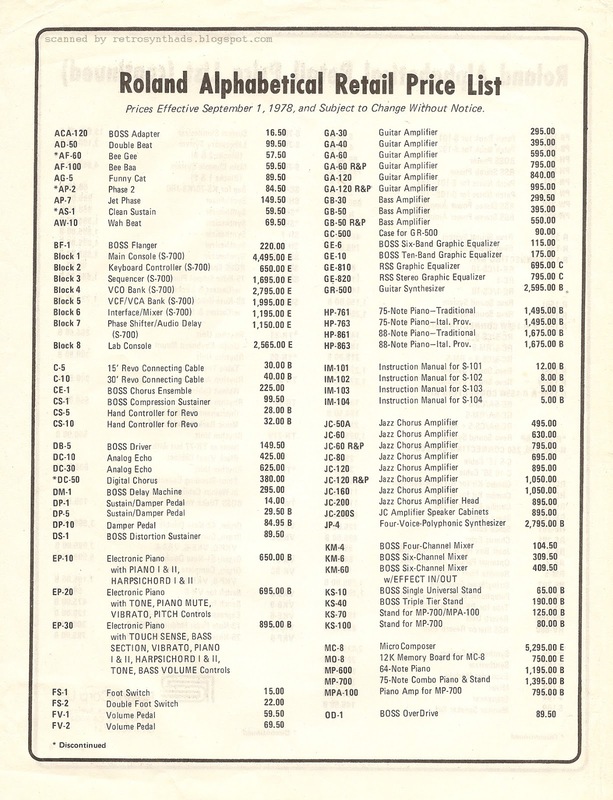 The pricing for the individual S-700 blocks is also there, but because the list is in alpha order, I almost missed 'em because they are on other side of the page. 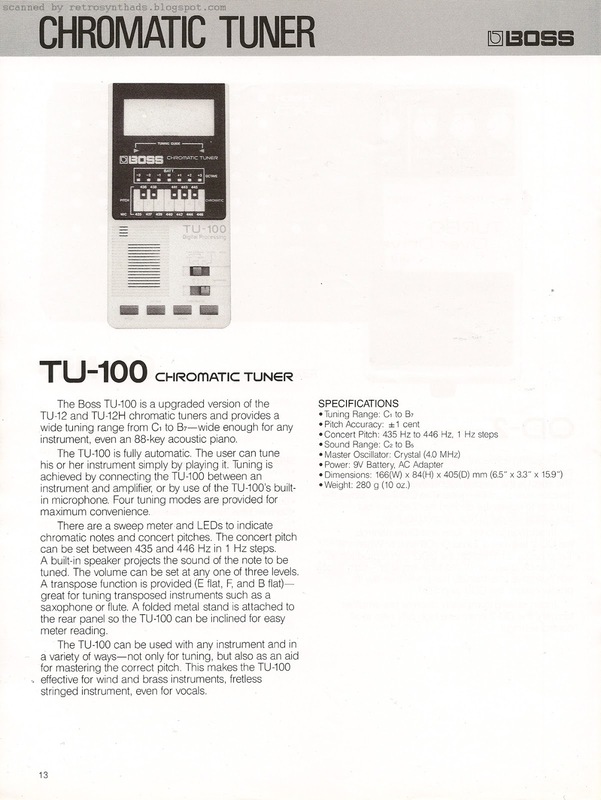 Keep looking and you'll find pricing for the early TR drum machines and the SH- family of synthesizers. 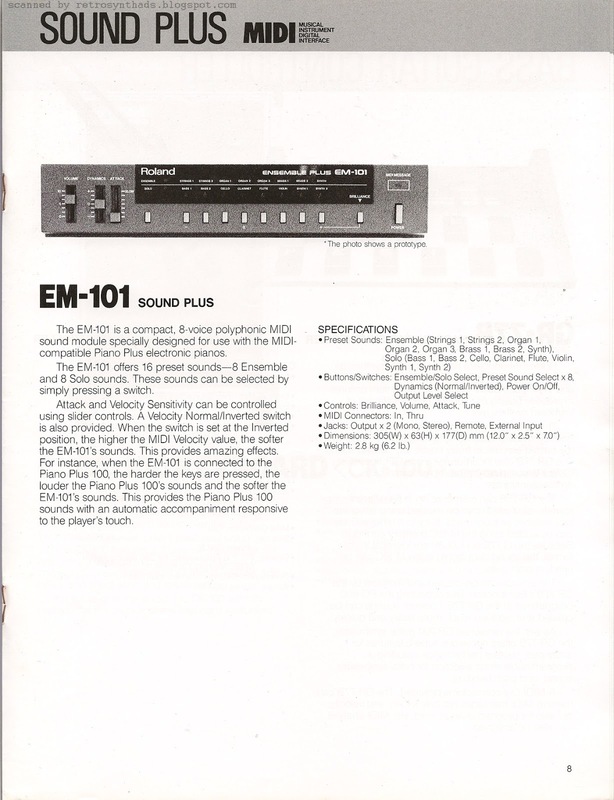 The RE-101, 201 and 301 Space Echos are also here. And those cute early Boss mixers. And see those asterisk symbols by the TR-33, TR-55 and TR-700? 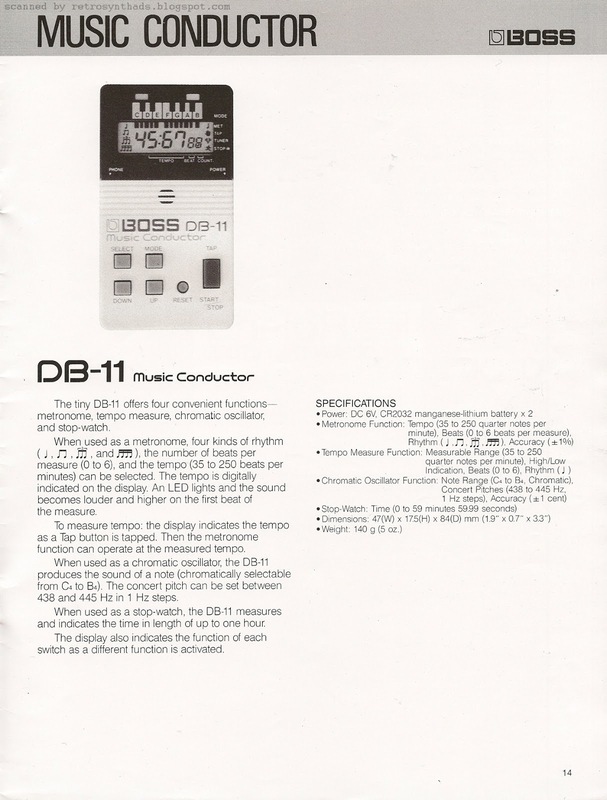 Those indicate that the units were recently discontinued, giving us a fairly accurate date of when these early drum machines were taken off the market. Roland Canada's drum machine history page tells me these only came on the market in 1972, giving the three machines less than a two-year life span. This list is pure gold. 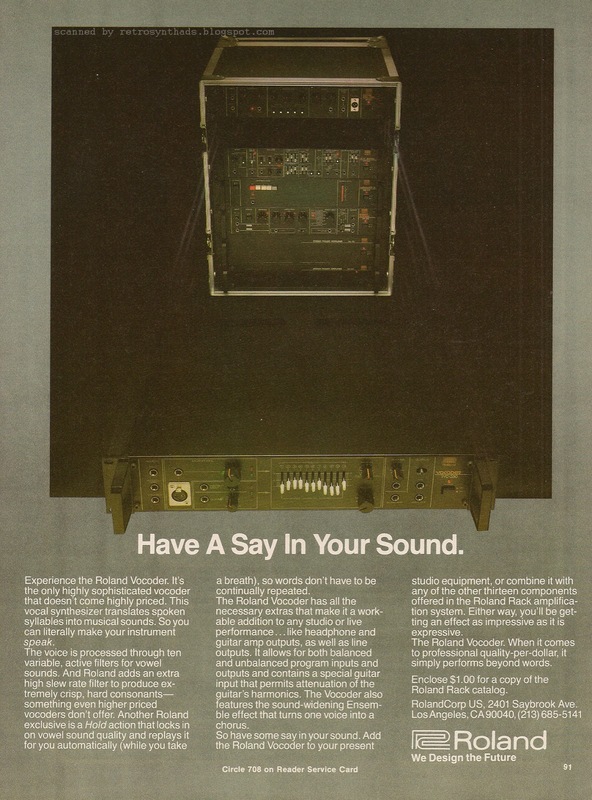 Roland SVC-350 vocoder "Have a say in your sound" full colour advertisement from page 91 in the July 1980 issue of International Musician and Recording World. No offense to my first love - Keyboard Magazine - but lately I've been spending a bit of free time flipping through some of my other magazine archives. 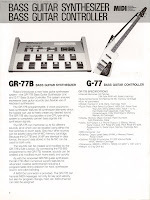 That's how I came across that CR-68/78 ad I posted earlier in August. 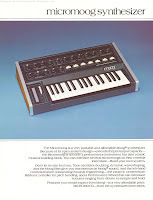 And now I've got this lovely vocoder ad. This ad doesn't have the same sense of humour as the previous one I posted, but I gotta say I find it just as interesting. Full disclosure - I own an SVC-350 and *love it*. So, you may wanna take my interest with a grain of salt. So, one of the most interesting things about this ad is summed up in that ol' saying: "You can tell a lot about a person by the company they keep". 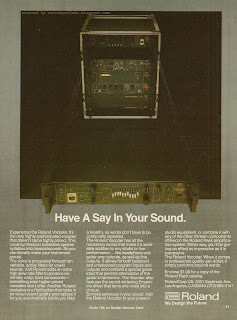 In this ad, Roland has chosen a photo of the SVC-350 pulled out of a rack that includes some of their other rack gear - a guitar pre-amplifier, stereo flanger, pitch-to-voltage synthesizer, digital delay and Dimension D. Together, Roland has named these and a number of their other effects, the "Roland Rack" system. I hadn't heard this term used to officially describe their rack gear before. 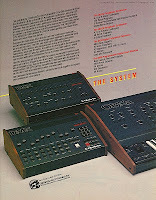 The word "system" was a buzz word that appeared in many gear-related ads during the 70's and 80's. 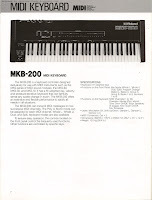 For example, Korg used it in their 1984 "The Korg MIDI System" ad that included their Poly 800 and EX800 synthesizers, RK 100 remote keyboard, KMS-30 synchronizer (a personal favourite) and computer software. Oberheim used the term "The System" in a 1982 ad to describe the proprietary multi-pin technology used to get their OB-Xa/OB-SX/DMX/DSX gear to work together. 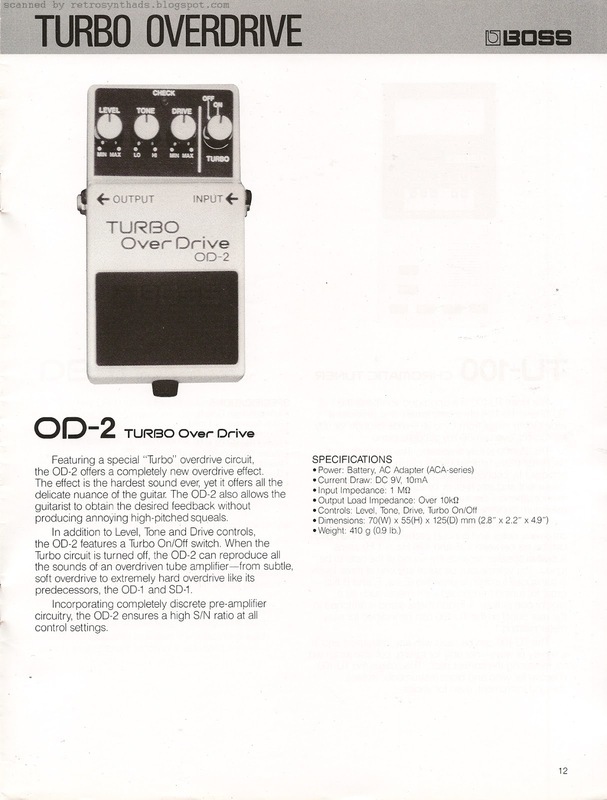 They continued using it in 1983 when they swapped out the synths for their OB-8. 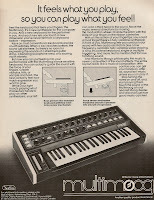 Even earlier sightings can be seen in a 1978 ad where the Oberheim SEM teamed up with 360 Systems' Slavedriver to create their own "The System". 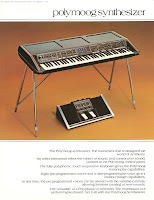 And it wasn't just in ads - just look at the name of some of Roland's early synthesizers like the System 100, 100m and 700. 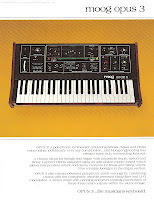 Or Moog's System I, II and III modulars. One more thing I noticed. After reading the ad-copy over a few times, something was nagging at me and I couldn't figure it out for the longest time. Then it hit me. 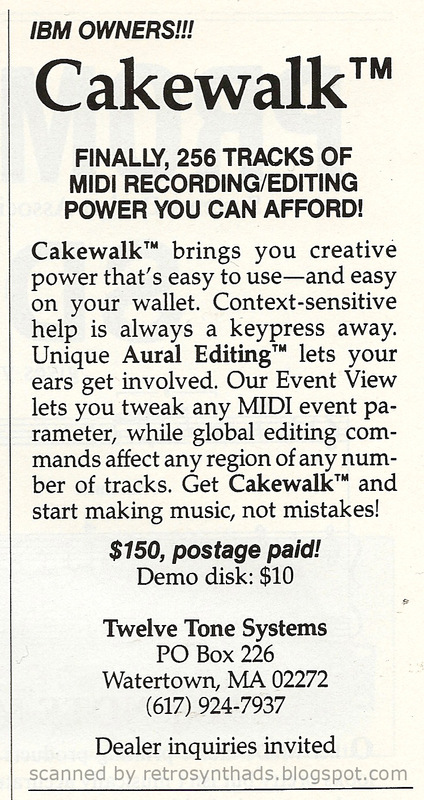 At no point does Roland mention the model number of their vocoder in the ad-copy. Its always just referred to as the Roland Vocoder. 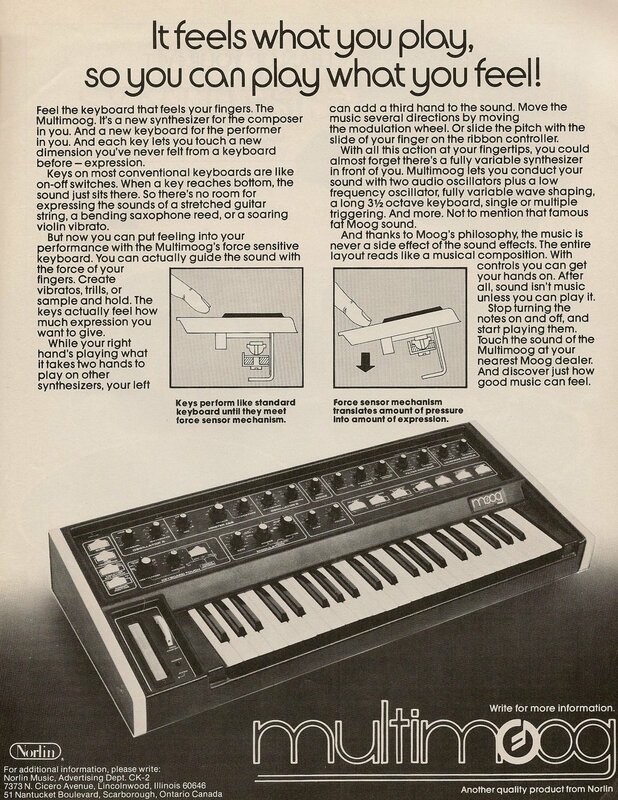 It would be like calling your synthesizer "Roland Synthesizer" in the ad-copy of a JX-8p ad. I checked the ad for the pre-amplifier that is part of the rack system which ran prior to this one, and its model name - SIP-300 - is referred to multiple times. Maybe because there are other Roland preamps but only one vocoder? 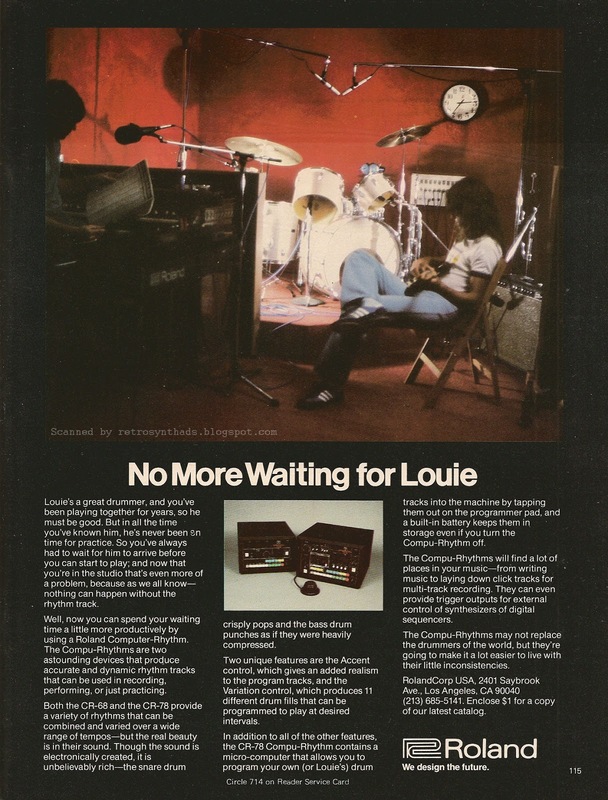 Roland CR-68/CR-78 drum machine "No more waiting for Louie" full page colour advertisement from page 115 in the November 1979 issue of International Musician and Recording World magazine. How time flies! Happy 8/08 day! And what has now become kind of a tradition, I've uploaded this lovely 808... er.... wait a tick! 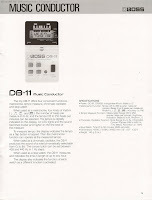 Actually, I've uploaded a scan of an advertisement for the predecessors of the TR-808 - the CR-68 and CR-78 drum machines. I haven't seen this ad online, so if it hasn't been available there, I'm happy to get it onto the record (pun intended). Where to start? Well, for one, the ad-copy is very well done. 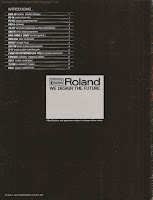 I say its well done because Roland strays a little bit away from their usual no-nonsense "We design the future" text to poke a little fun at those drummers reading International Musician. A perhaps risky move since at the time synthesizers and drum machines were viewed by more than a few "real musicians' as just boxes of job-stealing tubes and wires. "The Compu-Rhythms may not replace the drummers of the world, but they're going to make it a lot easier to live with their little inconsistencies". Well played, Roland... well played. Especially since these drum machines ended up on many hit records anyway including ‘Heart of Glass’ by Blondie and ‘In the Air Tonight’ by Phil Collins. As mentioned above, the CR-series directly preceded the TR-808 drum machine, coming out in 1978 according to Roland's own "Roland Drum Machine History 1964-2016". A great treat for anyone who hasn't scrolled through it yet. 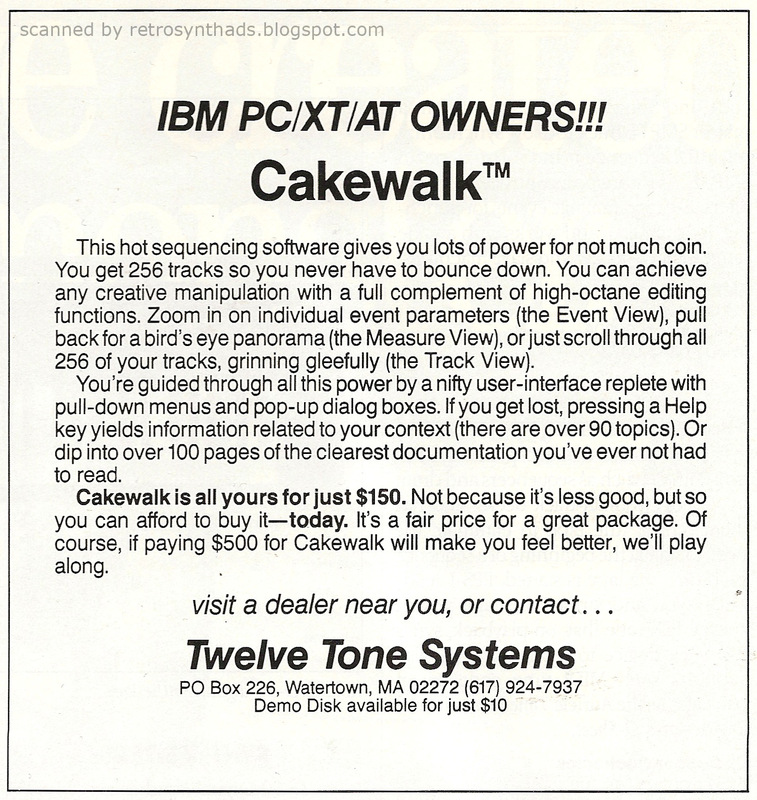 I'm a little sad that the photo of the drum machines are so small in the ad. I love the look of these machines. The wood-grain sides. The dials. The buttons. And also the colours - some of which went on to appear within the TR-808 colour scheme. 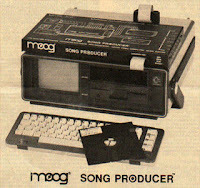 One thing suspiciously missing from the ad is the CR-800 - a third CR- drum machine that also came out in 1978. 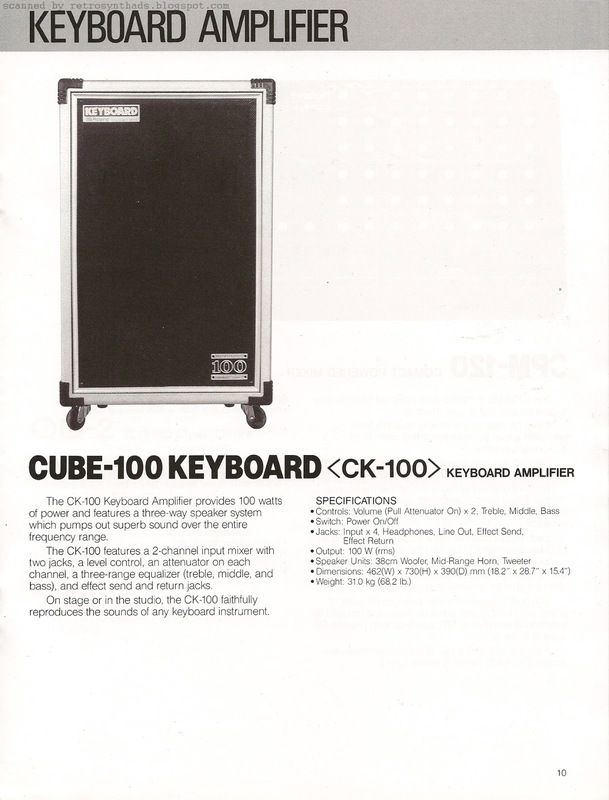 This was kind of a mash-up between the CR-68 and 78, built within a large floor speaker. Jon Dent's blog goes into some great detail (with large photos!) 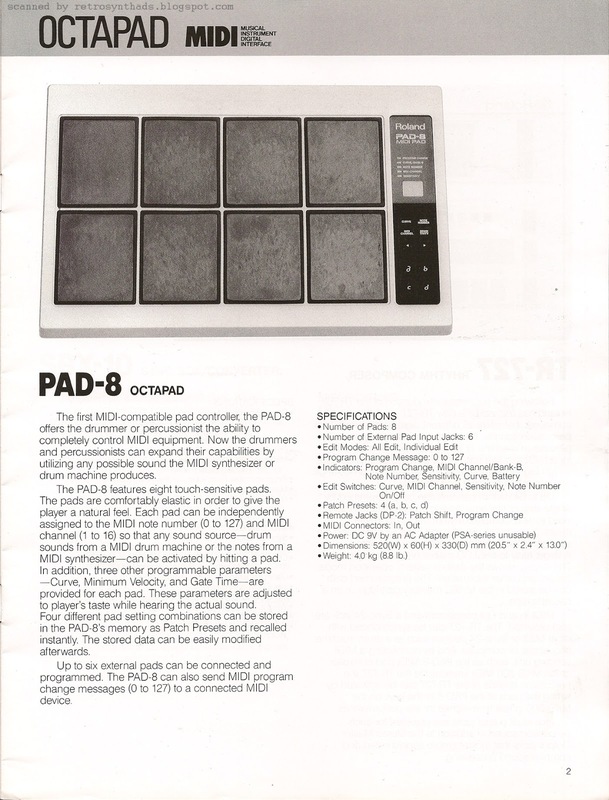 on the similarities and differences between all three of these drum machines in a Feb 2015. Definitely check it out. Time to go enjoy the rest of my 8/08 day! 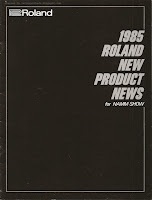 1985 Roland New Product News for NAMM show 16 page black and white brochure from June 1985. Another big XOX day! 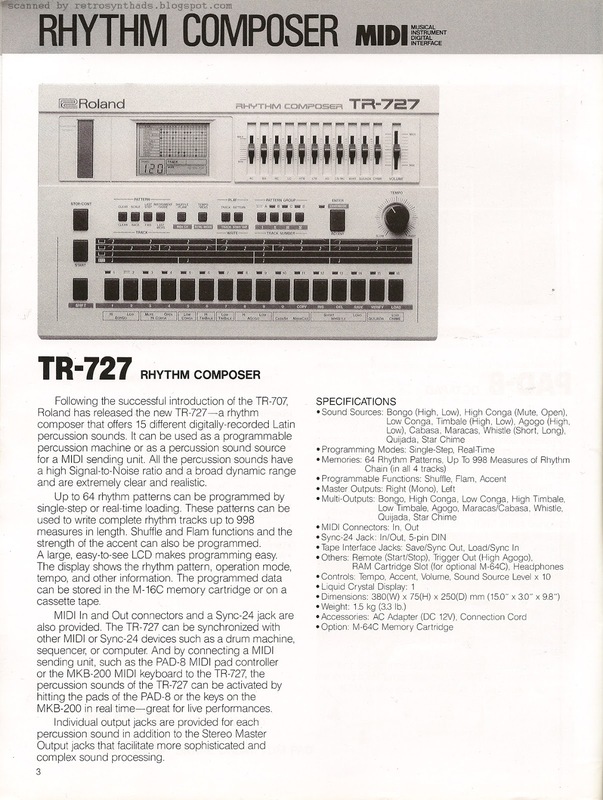 This time celebrating all that is awesome about the TR-727. Heck, who doesn't love the Agogo and Whistle sounds from Phuture's Acid Tracks! Quite by accident, I just looked on Twitter and Roland tweeted out a Boss Summer NAMM highlights video. 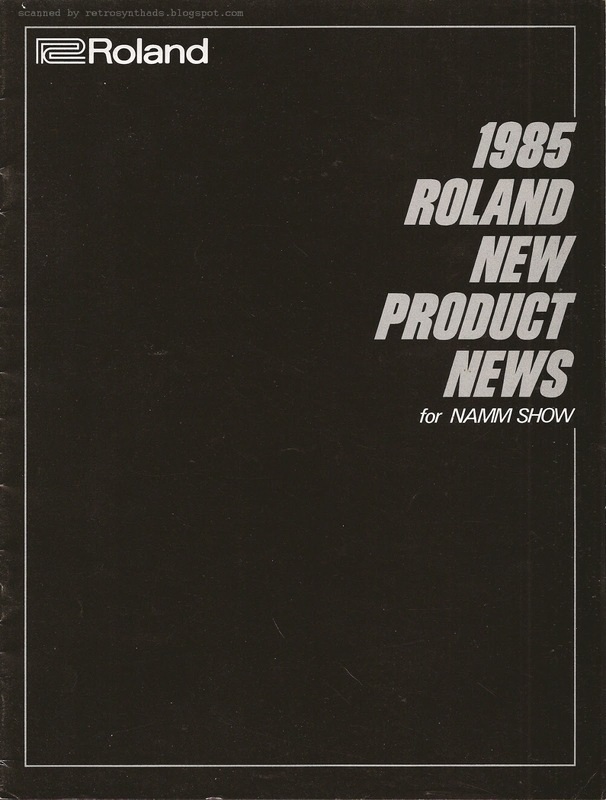 Honestly, a total fluke that I'm posting a Roland NAMM brochure from 32 years early. 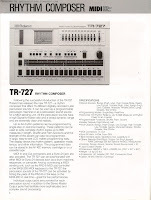 And if you haven't guessed, Roland features the TR-727 in this "new products" brochure that they handed out at Summer NAMM 1985. 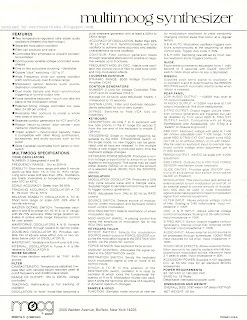 And it had good company - so many great products are including in this document. And they all have one thing in common (besides the obvious) - SPECIFICATIONS. As far as the eyes can see. Damn I love specs. 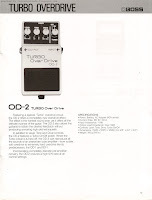 Each summary write-up does a great job including various other Roland gear that would be compatible. 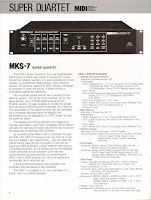 For example, the summary for the TR-727 pulls in the Pad-8 MIDI pad controller and the MKB-200 MIDI keyboard - both also featured in the brochure. 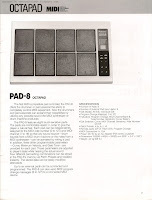 The Pad-8 Octapad was a piece of gear I had always wanted but never managed to pick up. I so wanted to stand on stage and summon my inner Depeche Mode a la Construction Time Again. 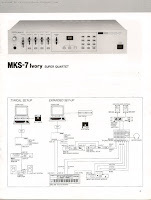 Another great highlight are the two pages devoted to the MKS-7 - both the black and ivory versions! 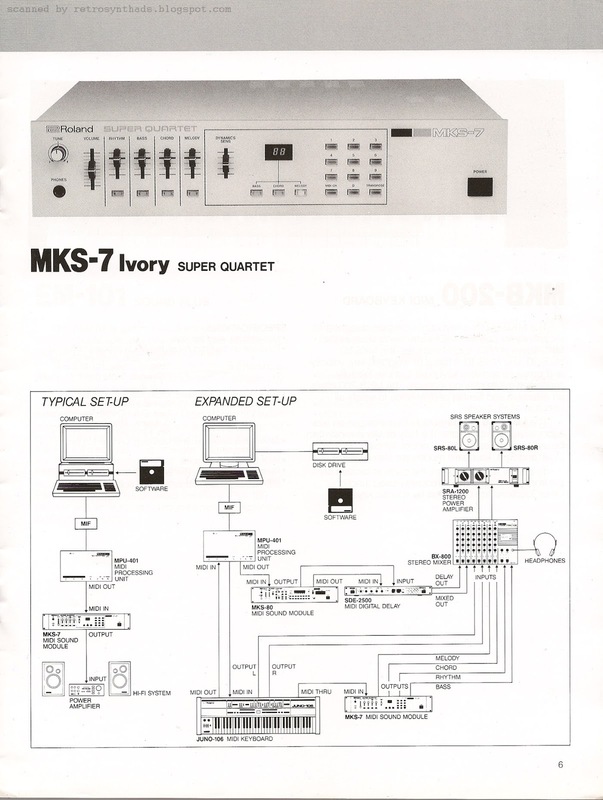 Every once in a while an ivory MKS-7 pops up around town but I always miss out on picking it up. Under the photo of the ivory rack are diagrams of typical and expanded set-ups featuring many of Roland's products. Yum. 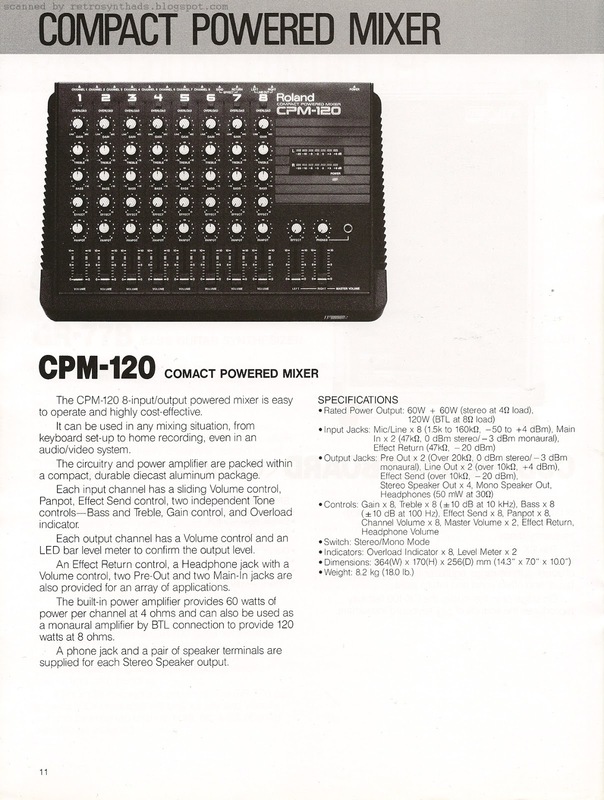 One thing missing from today's market is something akin to Roland's CPM-120 compact power mixer. Eight channels including an effects send/return, all in a small box. 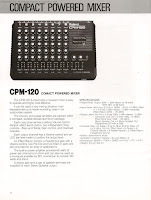 I still use Boss's mini-mixers of the era and would snap up a CPM-120 if it was ever remade. 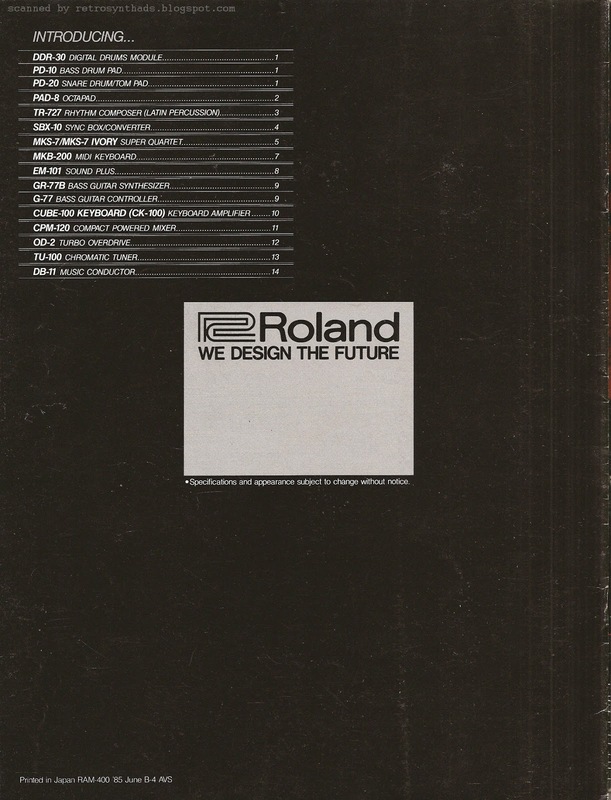 The back of the doc includes a table of contents as well as Roland's logo and tagline - "We design the future". Its hard not to think that Roland's current "The future redefined" tagline for many of their remakes isn't a nod back to this original tagline that featured many of the originals. If I was gonna quibble, I'd say the only thing missing are suggested retail prices. But I ain't complaining. I love this brochure from cover to cover.